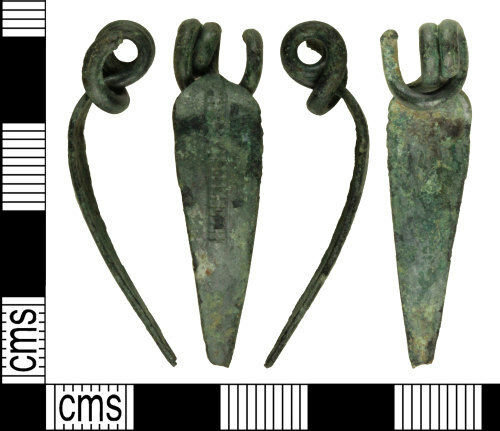 An incomplete copper alloy Iron Age brooch La Tène III type dating to the period AD 20-100. Part of the spring mechanism is old broken, pin and cathcplate are missing. The brooch measures 36.87mm in length, 9.36mm in width, 0.73mm in thick and weights 2.43g. The head consist of an old broken spring mechanism with two curls at the top and one curl wrapped around the lower section of the top of the bow. One of the curls extends into the bow which is leaf-shape and tapers slightly to the foot. The front of the bow is decorated with two parallel lines running down throught it and framing a central band with a series of punches on it. The reverse part is smooth and undecorated. The object is covered with a green patina. For a similar brooch Cf. Hattatt, R, 2007, p. 290, no. 237.